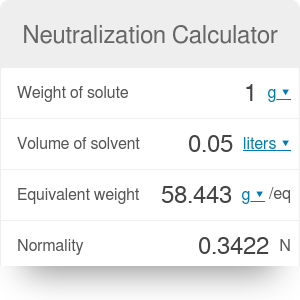 This neutralization calculator is a tool that helps you analyze reactions in which acids and bases are neutralized. You can use it to find the normality of the solution, but also to calculate the equivalent weight of the analyzed substance. Read on to find the formula used by this neutralization reaction calculator along with an example of application. A neutralization reaction is a a chemical reaction, in which an acid and a base interact with each other. The result of this reaction is the formation of a salt. In case of strong acids and bases, the essential reaction is the combination of hydrogen ions with hydroxyl ions to form water molecules. Normality is a value that measures the concentration of the substance (acid or base) in a dissolving liquid. It is measured in the unit N equivalent to eq/L. Mass of solute is the weight of the substance of interest (acid or base), expressed in grams (g). Volume of solvent is the volume of the liquid in which the substance is dissolved. It is typically measured in liters (L). Equivalent weight is equal to the molecular weight of the substance (acid or base) divided by its valence. You can easily find this value for most common substances. It is expressed in g/eq. Determine the equivalent weight of your substance. For example, the equivalent weight of sodium chloride (NaCl) is equal to 58.443 g/eq. Decide on the mass of your substance that you want to neutralize. Let's assume you have 3 g of sodium chloride. Choose the volume of the solvent (liquid). We can assume you want to dissolve your NaCl sample in 0.1 liter of water. Make sure to take a look at our molarity calculator, too! Neutralization Calculator can be embedded on your website to enrich the content you wrote and make it easier for your visitors to understand your message.